2018 was an exceptional year for The Cliffs Interpretation Centre, which received five prestigious awards in 2018, related to the innovative approach of La Pinta Ltd in merging gastronomy and information provision, through a best practice approach related to sustainability and its three pillars. The project is self-sufficient, whereby revenues from the catering facilities are used to provide visitors with the necessary free information, expertise and support resources to explore the area. Living at Dingli, having a sense of belonging to the rural environment and being linked to the area’s stakeholders in the area, La Pinta Ltd. saw the need to blend the environment, tourism, culture and local aspects in one comprehensive experience. In fact, at The Cliffs Interpretation Centre, visitors can make use of several public facilities, including information resources, walking guides, all-year round free eco-walks, meeting and exhibition spaces, and catering facilities. 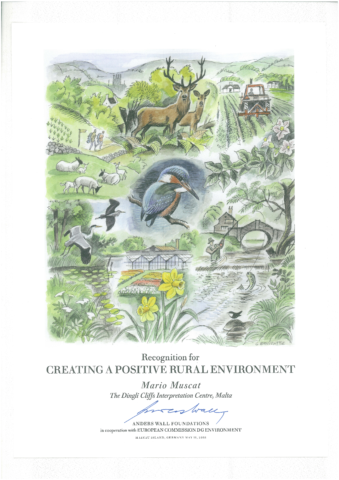 The prestigious Anders Wall Award Environment is dedicated to recognising individuals or organisations for their special contribution to the rural environment within the EU, with achievements related to preserving the landscape and cultural heritage, providing biodiversity and contributing to sustainable local development. La Pinta was awarded the Diploma of Recognition for its positive environmental impacts with benefits at the local, national and European levels. The Anders Wall Award is organised by the Anders Wall Foundation in association with the European Commission – Directorate General for the Environment, the Royal Swedish Academy of Agriculture and Forestry and the Friends of the Countryside. The Anders Wall Award ceremony was organised at Constance Lake, Germany in May 2018, and La Pinta Ltd. was invited to address the guests and fellow nominees, to explain the innovative concept of The Centre. The Cliffs Interpretation Centre has been declared as one of the destinations of sustainable cultural tourism in Europe through the ECTN Sustainable Cultural Tourism Award. 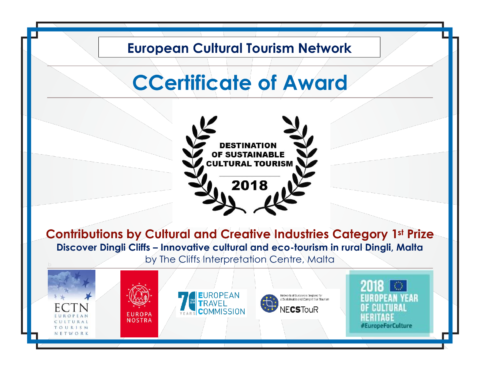 The special edition was organised by European Cultural Tourism Network (ECTN) in partnership with Europa Nostra and the European Travel Commission, as a contribution to 2018 being the European Year of Cultural Heritage (EYCH 2018). The contributions of cultural tourism relate to the protection and promotion of cultural heritage, extension of the tourism period throughout the whole year, and the increase in awareness of both locals and tourists. The Centre’s achievements have been recognised as an example of excellence with significant and evident results in enhancing visitor experience, while respecting traditions and involving local communities.